The HYNEMAN Companies site builds all our homes on 16" spacing. This applies to studs, ceiling joists and rafters. The building code requires 24" spacing. Most builders frame studs at 16" but not joists or rafters. WE DO. The next time a 150 mile per hour wind hits the coast, which roof would you rather have over your family's heads? 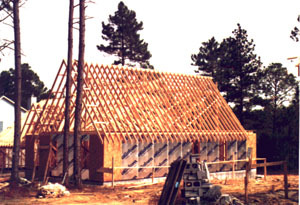 Ask your builder the framing requirements for their roof. This is just one of the quality features we incorporate in all our homes, whatever the price. ...but all construction from brick and sheetrock is like make-up -- what blemishes get covered up? When you're paying for a home for 30 years, what assurances do you have that the structural integrity will outlast your mortgage? 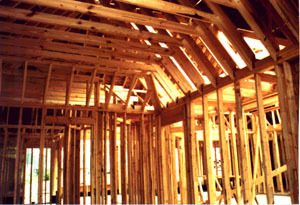 The HYNEMAN Companies incorporates many construction standards in all our homes to provide you with "peace of mind." All images and Text ©1996 Hyneman Companies L.L.C. This page is best viewed with Netscape 2.0 or later.